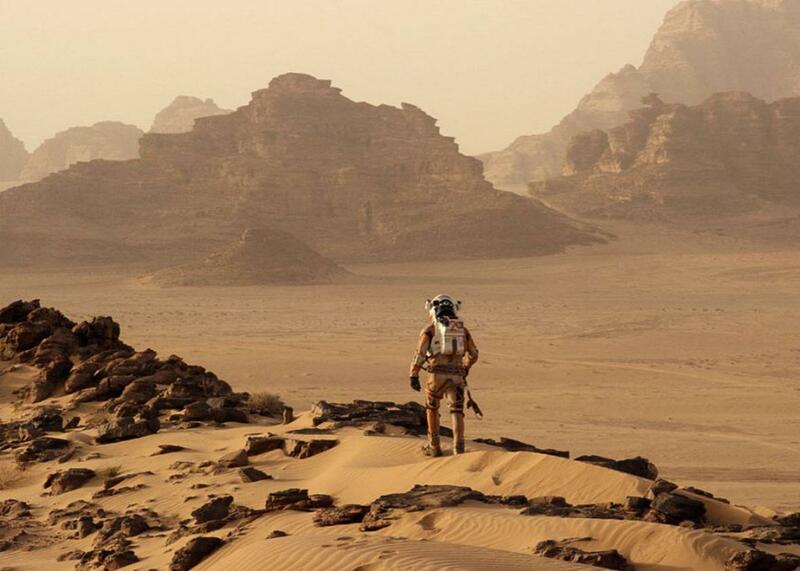 NASA and the real science behind The Martian. Matt Damon in The Martian. As a card-carrying space nerd and NASA’s chief scientist, I love space movies, from Star Trek to Star Wars to my all-time favorite—The Dish, an Australian comedy that celebrates that first moment when Neil Armstrong stepped down onto the surface of our moon. Up until now, I am somewhat embarrassed to admit my favorite Mars movie has been John Carter. But that now has been superseded by The Martian. The Martian, set in the 2030s, covers the travails of the third human mission to Mars. Aided by NASA scientists, the film gets much right—from technologies NASA is developing now, to accurate Mars geography. You may be wondering how realistic The Martian is. In fact, President Obama has stated a goal of getting humans in the Mars vicinity in the 2030s, and NASA is working hard to make this happen. Our journey to Mars has already begun, and we have put our most brilliant minds to work on each of its three main phases. The first is what we call the Earth-reliant phase: technology development and human health risk reduction that we work on every day on the International Space Station. The one-year mission aboard the station right now, with astronaut Scott Kelly and cosmonaut Mikhail Kornienko, is a big part of this. We need more data on the long-term effects of microgravity on human health, and we will use the next several years on the ISS to develop countermeasures to health effects like bone density loss and muscle wasting. Mars missions will require up to three years in reduced gravity, so we need to make sure astronauts can not only survive but thrive, as they move outward to explore this new world. The second phase of our journey to Mars takes place in what we call the proving ground in the early 2020s. We are preparing to send humans beyond low Earth orbit to the vicinity of the moon for the first time in decades using our new rocket, the Space Launch System, with the Orion capsule. In this proving ground out near the moon, we will test systems needed for Mars missions, like advanced life support systems and advanced propulsion, while still being able to return to Earth in days, rather than the 7–8 months it takes to get back from Mars. In the meantime, we will continue to explore Mars with robotic spacecrafts like the Curiosity rover, making measurements such as characterizing the radiation environment to ensure humans can safely explore the Martian surface. Also in the 2020s we will be testing advanced entry, decent, and landing—or EDL—systems at Mars that we will need to land human exploration payloads much larger than those we’ve landed with robotic explorers. The third phase of our journey to Mars will look much like the Ares missions of The Martian. An international team of astronauts will orbit Mars, maybe visit the Martian moons, and eventually explore the surface of the red planet. We may be able to use the water we have discovered on Mars for rocket fuel and to help humans survive; that will allow us to live and work on Mars, conducting scientific research on the surface. Our astronauts will wear advanced space suits that give them increased mobility, bringing the intuitive thinking and flexibility to Mars exploration that only humans can. And then we will bring those astronauts safely home. As we visit Mars multiple times, we will build up infrastructure on the surface to expand the capabilities and reach of humans on Mars. We can make this happen in an affordable way by joining forces with our international partners. In fact, 16 space agencies from around the world are already working together on this. We also will partner with the commercial sector in new and innovative ways and bring the public along through citizen engagement projects like technology challenges and prizes. The Martian may be fiction, but at NASA we are working to make it a reality. One quibble I have with the movie is that it neglects to address the ‘Why Mars?’ question. This is the most important question behind everything NASA does. Part of why we explore is human nature—showing we can push ever outward toward the next frontier, developing new technologies and reaping the economic rewards as we do so. But as a planetary scientist and a lover of another science-fiction film, Contact, I also want humans to go to Mars to address the fundamental question, “Are we alone?” Mars is the most likely place where life evolved beyond Earth, with water stable on the surface for more than a billion years. Those first missions to Mars (from which we will bring everyone home!) will have astrobiologists and geologists from around the world searching for evidence that life evolved on Mars and what the implications of that life are for life here on Earth. The Dish celebrates one of humankind’s greatest achievements. The Martian gets us ready for the next one that NASA is working hard to realize—the first humans to walk on the surface of another planet and help us to find life beyond Earth.